More showers are moving through our area Wednesday night. As of 4 p.m., the rain is mostly to the west of our region, out past Warrenton, Va., but it will most east before clearing up around 11 p.m. or midnight, said NBC4 Meteorologist Veronica Johnson. We should pick up another 1/10- to 1/4-inch of rain, with spots south of D.C. most likely to see accumulation. The good news? Tomorrow should be mostly sunny, with a rapidly clearing sky as the day unfolds. The day should be breezy to windy, with winds up to 30 mph. 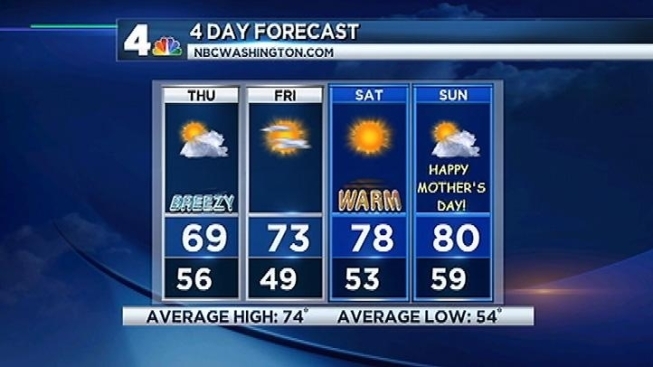 We should also expect a nice weekend for Mother's Day, with highs of 76-80.